At the recent ICSC Recon Convention in Las Vegas, over 37,000 attendees were exposed to a ADRail sponsorship program for conference exhibitors Inland, Colliers, Crunch Fitness and Papa Murphy’s Pizza. 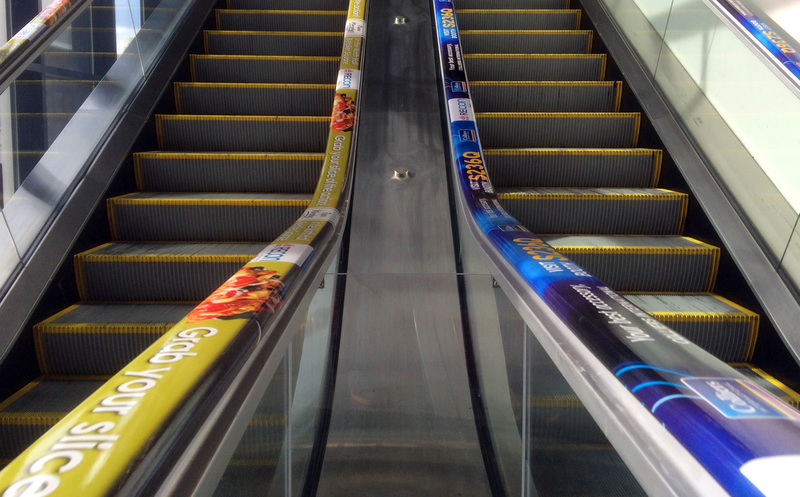 The handrails alerted delegates to offers at booth locations and all involved had great results. If you are an event organizer, this can truly be a win/ win solution. AdRail is available in 15 top convention centers and hotels nationwide, allowing you to generate new sponsorship revenue, while offering exciting promotional opportunities to your exhibitors. ADRail is the perfect media for any trade show, reminding visitors of your presence and effectively driving them to your booth to learn more. Following a successful campaign last year for the AAAAI show, Teva Pharmaceutical is back again, this time in the Grand Lobby at Walter E Washington Convention Center in DC for the October AAFP Show. As the VP Marketing attests: ‘In my 20 years of marketing, I’ve never seen a more ingenious – or more effective – form of advertising.’. October 15, 2014 by Webmaster in News, Trends | Comments Off on Stay Ahead of the Curve! The key to successful advertising is letting the consumer – and not the technology – lead the way. AdRail’s low tech solution puts brands in the hands of prospects and it doesn’t get much better than that!